← Medieval Monday ~ Travel: Dragon Knight’s Ring! Cancer has touched many in our lives, including my own. 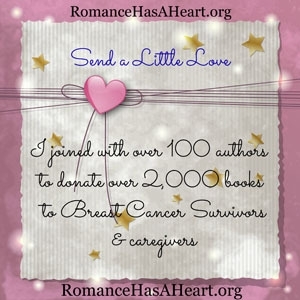 So, I’m proud to be part of this special giveaway with over 100 authors donating over 2,000 books to cancer survivors and caregivers. During October, Breast Cancer Awareness Month, you can nominate a recipient and order a free book for them! Click here: Romance Has a Heart for more information! Hey Mary! Thank you so very much for being involved with this special group of gifted people. I’ve been fortunate not to have anyone in my family other than a very dear aunt who passed away from breast cancer. She was one of God’s angels. Although I do not have beast cancer, I was diagnosed with lymphatic cancer; however, at this time God keeps His hand on my shoulder and I am stable. I am so blessed more than many who suffer with any type cancer. So thank you again Dear Mary for helping to ‘spread the word’ for I truly believe you also are one of God’s angels! Much Love With Huge Hug! Sad that man explores other universes and hasn’t been able to eradicate this horrible disease. Or is it done on purpose? O had it in my family, too. Many years ago. My mother’s sister. A very dear aunt for me. And a lot of acquaintances. May your endeavor be successful! Thanks, Carmen. I often think that the cure is right under our noses…waiting to be found. I can only pray that they’ll discover it in my lifetime and soon!